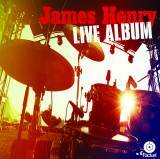 Debut release from Houston blues guitar legend, James Henry. (James is also known as "Eddie Hash" alongside Ty Tabor and Wally Farkas in Xenuphobe.) Henry took home the "Houston's Best Guitarist" in 2012 at the Houston Press Awards and also performed live with Tabor and Farkas at their Guitarnival show last September. "Live Album" is a blisteringly intense blues guitar smackdown, recorded at the For the Community Festival 7 at Last Concert Cafe in Houston, TX (2/22/14). The rhythm section backing James is Thurman Robinson on bass and Mike Morris (of C. J. Chenier fame) on drums.